Say goodbye to grease, carbon deposits, germs and food splatters! How? By taking advantage of the high-quality kitchen cleaning services our experienced and dedicated cleaners carry out for customers, residing in London and the boroughs around. There are many cleaning contractors in the area, but we are among the few to offer excellent quality at rates that customers can easily afford. The service is covered with a full public liability insurance and is carried out by vetted, experienced cleaners, we have reference-checked ourselves for your peace of mind. Most of us spend plenty of time in the kitchen as this is the place where we prepare our daily meals or cook for our guests. The results of this overuse, unfortunately, are far from pleasant as grease and grime in the kitchen accumulate at a shocking pace. Fret not! Our cleaning experts can restore the gleam of your kitchen quickly and efficiently, and do it at a competitive price. We provide our services in almost all London areas including Kingsbury, Wandsworth and Southgate. Our friendly and committed cleaners can visit you at a time that suits your hectic schedule and clean your kitchen from top to bottom, causing minimum disruptions around your home. Please note, this is a deep cleaning service which covers all surfaces and areas in your kitchen, including those that are difficult to access or reach. You can find us also in Tooting and Harringay. All appliances, including dish washing machines, freezers, fryers and refrigerators will be comprehensively cleaned. Special attention will be paid to your oven, the most problematic appliance. The latter will be disassembled and all removable components will be degreased. Carbon deposits will be effectively removed which will increase the oven’s efficiency. Our team will clean your cupboards, worktops, doors, light switches, and floors. Interested? 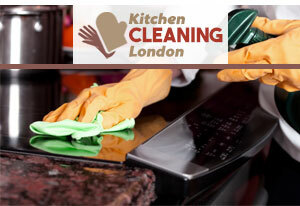 You can book our unique kitchen cleaning services, available in London, over the phone or via our online contact form!